View More In Cable Sleeves. With our premium cable management sleeve, you can easily manage all kinds of cords, cables and wires in your home and office well-organized and out of sight. Bringing you a tidy, comfortable and enjoyable working and living environment. Perfect solution for pets who chew electrical wires and cords, as our cable sleeves are made with abrasion and flame resistant material which is UL | ROHS | REACH | Halogen Free. Protective cable covers can be cut to any length to match your organization needs. You do need to ether cut it with a HOT KNIFE to prevent fraying or melt the ends a bit with a lighter after you cut it. ★【Neat & Tidy】- Say goodbye to cluttered cabling eyesores that are impossible to ignore. Our expandable braided cable organizer will keep your wiring setup organized and tangle-free. Ensures that the cables behind your TV or computer remain neat and tidy. Flexible braided material ensures it won't scuff up the room either. ★【Durable & Flame Resistant】- Perfect solution for pets who chew electrical wires and cords, as our cable management sleeves are made with abrasion and flame resistant material which is UL | ROHS | REACH | Halogen Free. ★【Adjustable & Easy to Install】- Protective cable covers can be cut to any length to match your organization needs. You do need to ether cut it with a HOT KNIFE to prevent fraying or melt the ends a bit with a lighter after you cut it. ★【Expandable & Flexible】- Diameter can expand up to 150% to fit a wide variety of cable gauges, cables feel protected but still flexible. Ideal for installs where a some extra protection is needed. 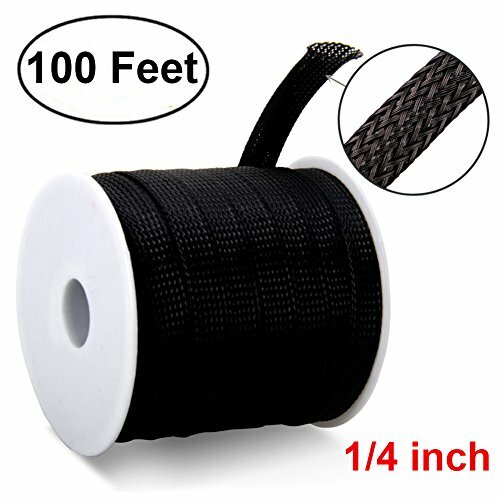 ★【What You Get】- MILAPEAK 100ft -1/4" Flexible PET Expandable Braided Cable Sleeve. Also available 1/2" Expandable Braided Cable Sleeve in our Amazon store. And our 1 Year Free Warranty and Full Refund within 30 Days ensure pleasant shopping experience. If you have any questions about this product by MILAPEAK, contact us by completing and submitting the form below. If you are looking for a specif part number, please include it with your message.